Apparently teenagers like furniture that doesn't go with any of their other stuff and beds that will give them back problems for life. 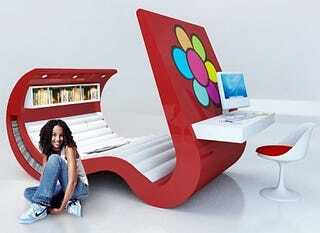 At least that's what this Wave Chaise designed for teenagers by Roberta Ramme leads me to believe. Yeah, it's sassy, but is it really a better solution than just getting a regular bed and desk?